The mighty Google Plus on Wednesday 22nd October, 2014. 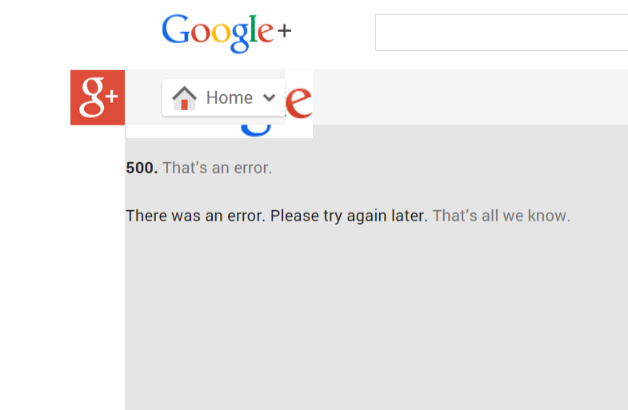 Gmail and Google Plus are both returning errors. After trying to log in today both failed to load pages. Users might have to soon use Twitter or Facebook! “Returning errors” is a polite way of saying that they are both borked, which is a geeky way of saying that they are buggered. While this is not really major news (my own blog went offline the other day and I failed to report this, and neither did anybody else for that matter) it does mean that I could not do the two tasks that I had set myself to do while still sipping my morning coffee – pretend to work while reading messages. An attempt to contact a Google rep over Twitter has so far failed. Although maybe an alert was sent via Gmail but I am yet to receive it because Gmail is broken, Maybe I should check Twitter for replies instead – hey, is that how it is supposed to work? Oh, hang on, it’s all working again now. Shall I still publish this “news”? Hmmm. Yeah, might as well. That’s what everybody else does. There was an error loading your posts. Try again ……. Or maybe just have another coffee. on google chrome can use, on firefox not. That’s an odd thing.